HTML templates allow you to limit the maximum height and width that an image can have when you export. This can be useful if you need your images to fit within certain dimensions to display properly on a web page. 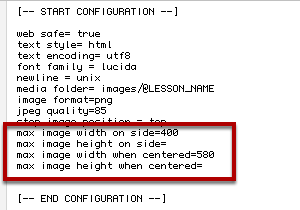 As of ScreenSteps version 2.7 you can change the maximum image width in the Preferences > Templates pane. Just open the HTML Templates pane (1) and modify the Max Image Width property (2). If you are not familiar with template files take a look at this lesson on how to locate them and this lesson which describes templates. There are two sets of template properties that you should be aware of. One set is used for images that appear on the side of the step instructions and the other set is used for images that appear above or below the step instructions. You can set just the width, just the height or both. 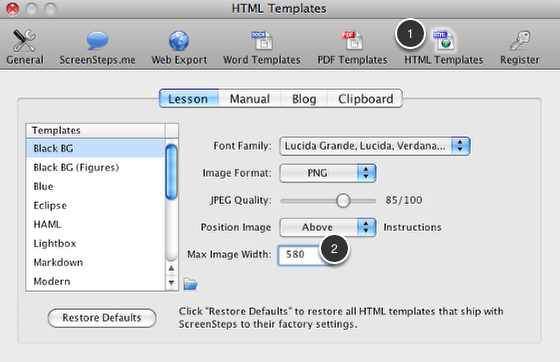 Here is a screenshot of one of the default templates included with ScreenSteps. In this template the maximum width an image can have when it appears above or below the step instructions is 580 pixels. There is no limit to the height of the image.